One of the common themes that I and other Councillors heard at the door past election was an appetite for greater resident input into shaping the budget. 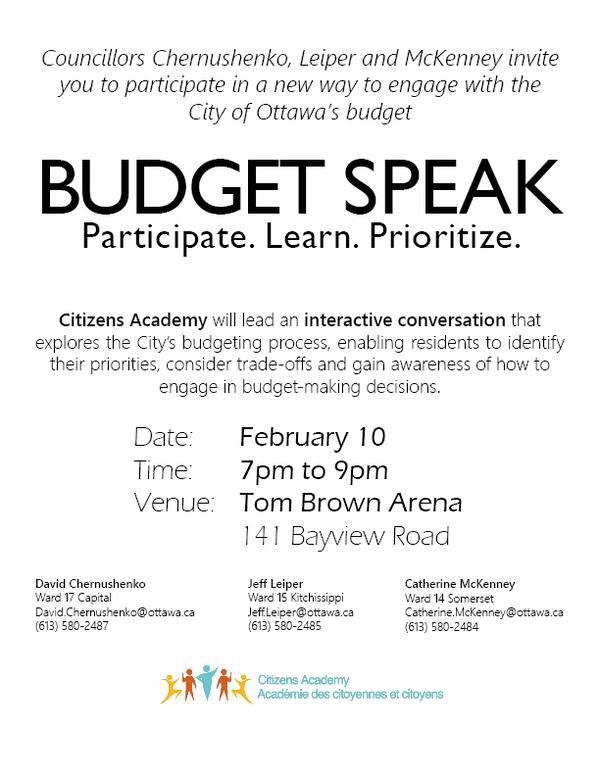 In response, Councillors McKenney, Nussbaum, Fleury, Chernushenko and I have engaged Citizen's Academy to lead an interactive discussion that explores the City's budgeting process. We anticipate that it will help residents identify their priorities, consider trade-offs, and gain awareness into the budget-making process. Councillors Nussbaum and Fleury will hold one session in the east end, while Councillors Chernushenko, McKenney and I are hosting one at Tom Brown Arena on February 10 from 7-9 PM. We hope there will be a good turnout to help guide us in our own participation with this year's budget-making.